Are you looking for a Reolink smart security camera but can’t decide between the Argus or Keen or C1 Pro? I think that it is a difficult choice because these cameras offer a range of options. Whereas the Argus and the Keen offer a resolution of 1080p, the C1 Pro offers a much higher 1440p. The Argus only has a digital zoom facility but the Keen and the C1 Pro can pan and tilt as well as the digital zoom. Both cameras offer a 360° view by panning 355°. The Keen and C1 Pro can both tilt 105°. Not surprisingly, the Argus has the largest field of view at 110° because it only has a fixed lens and not one that can pan and tilt. The Reolink Keen has a field of view of 90° and the C1 Pro has the smallest, at 80°. The Argus and the Keen are both battery powered. They need x4 CR123A standard (or rechargeable) batteries. The C1 Pro is powered by a power adapter. All three Reolink security cameras connect to a WiFi network. Also, the C1 Pro can connect to a router via an Ethernet cable. The Reo link Keen comes with a separate PIR sensor that connects to the camera unit wirelessly. The Argus camera and the C1 Pro have a PIR sensor built in. The Keen and the C1 Pro have a night vision range of 40 feet or 12 meters, whereas the Argus has a slightly more limited range of 33 feet or 10 meters. The Argus is the only camera in this comparison that is designed to be used outdoors as well as indoors. The Argus has an IP rating of 65 to prove this. An IP rating is the most trusted measure of any device’s suitability to be used safely outdoors. IP65 tells us that the Reolink Argus is totally dust proof and very waterproof. The Keen and the C1 Pro are only suitable to be used indoors. What is interesting is that Reolink, unlike other smart security camera companies, do not offer any cloud storage. The C1 Pro has the greatest number of storage options. The Argus and Keen in contrast, only offer micro SD cards as a form of external storage. And how are they similar? There are three main features that these Reolink security cameras have in common; motion detection, two way audio and live view. Individual zones can be created for your Reolink camera. It is easiest to do this via the Reolink Client software. Click on Device Settings, then Alarm and then Motion Detect. A live view of your camera will be shown. Using your mouse, click and drag to create a zone or click on “Full Screen” to cover the whole field of view or select “Clear Area” to turn motion detection off. Reolink take a fairly unique approach to motion detection sensitivity settings in their cameras. They allow you to split a 24 hour day into 4 different timed blocks and then each block of time can be allocated a level of motion sensitivity, which is on an adjustable scale from 1- 50, where a level of 50 is the most sensitive to motion. A step by step photo guide to setting up the sensitivity settings, using the Reolink Client, can be viewed here. A push notification will alert you every time that one of your Reolink cameras detects motion. But, you can turn these notifications on or off for each camera. A detailed guide on how to do this can be found here. As well as receiving a push notification, your Reolink camera will send you an email informing you that motion has been detected. The advantage of setting up email alerts is that they can have photos and short video clip attached to them, whereas a push notification is only a text alert. A helpful guide can be found here. Reolink cameras come with two way audio. Each security camera comes with a built in microphone and speaker so that a person who is right next to the camera can have a conversation with another person who is connecting to the camera via the Reolink app. 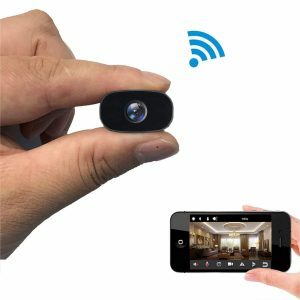 Live View is the ability to connect to a Reolink camera and view the camera’s footage live. Live View can be accessed via the Reolink app or the Reolink Client software. The Reolink app is available for iOS users and Android users. If you want to install it on your iPhone or iPad then your device will need to be running iOS version 8 or later. If you want to install it on an Android device, it will need to be running version 4 (Ice Cream Sandwich) or later. I have included a video below that provides a quick demonstration of the Reolink app. The Reolink Client is the name of the free piece of software that you can download to connect to your Reolink camera from your Windows or your Mac computer. Mac users can download it from here and Window users from here. The Reolink Client has lots of features. Downloading video to your PC. All of these features are explained in easy to follow tutorials, that you can find here. Of these three cameras, the only camera that allows for browser access is the C1 Pro. If you are using the app, just make sure that your phone is connected to the same WiFi network as you want the Argus or Keen to connect to. Step 1 Open the app and tap on the devices page. Step 3 Scan the QR code on the camera. Step 5 Add the camera to your WiFi. The following video will guide you through how to add a C1 Pro camera via the Reolink Client software. The process is slightly different because, to make things much simpler, connect your C1 Pro to your router using an Ethernet cable. After setup, you can remove the Ethernet cable. Just make sure that your camera is switched on and that you have the latest version of the Client software running. You can setup your micro SD card in three easy steps by using the Reolink app. Step 5: Tap the blue “init” button. Your SD card is now ready to use. Your might be much clearer in your mind about which of these cameras that you want to buy, but what do you actually get? The chart below outlines the main items that come with the security cameras. These three cameras offer a range of different options to meet different needs. And so in our final section, I look at each cameras pros and cons and what kind of person might buy each of these smart security cameras. The most unique feature of this camera compared to the other two cameras in this review, is that it can be used safely outside. And so the Argus is the most obvious choice for a buyer who is looking for an outdoor camera. The fact that it cannot pan and tilt means that it is a camera that is perfectly suited to monitor and focus on a specific area of a room or outdoor space. Although this camera is very similar to the C1 Pro, it is unique because it is battery powered. This means that it can be positioned in more places than the C1 Pro because it doesn’t need to close to an electrical socket. The ideal buyer for a Keen camera is someone who is looking for an indoor camera that can be positioned in a place where there are no electrical sockets and wants or needs a camera that has pan and tilt capabilities. Cameras that have mechanised pan and tilt capabilities are perfect for people who want to monitor larger rooms than cameras with fixed lenses or just rooms that are busier and have more activity going on in them. I think that this camera is aimed more at the home market than the C1 Pro because the Keen only offers micro SD storage. The C1 Pro is unique in a few important ways. Firstly, it has such a fantastic resolution. It has 4 MP against the Keen’s 2 MP. NVRs can store footage from multiple IP cameras (such as the C1 Pro) which makes them an ideal choice for businesses instead of home users. 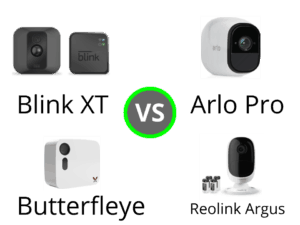 Blink XT vs Arlo Pro- Which Is Better?